In this series of blog posts, I have been talking about the steps in a personal injury case from start to finish. The purpose of these posts is to provide a roadmap for someone facing a claim for personal injury arising out of an accident caused by someone else’s negligence. This process is familiar to lawyers because we see it day in and day out. However, it may not be familiar to someone who has never been down this road before. If you are new to this series of posts, you may want to catch up on the previous topics before continuing. This blog post will talk about the last major step in the life of most cases – trial. If you haven’t settled your personal injury case after mediation, you will eventually have to go to trial. The average life span of a case from beginning to end is usually at least 1.5 years. Although the wait can be really frustrating, you will have to be patient because it will take time for your case to climb the jury roster. Your lawyer will try to give you as much advance notice as possible, but once the case reaches a certain age, you will have to be ready to go for trial when the court calls. Trial is not like what you see on TV – it is often tedious and boring. Trial is rarely any fun for anybody involved. You can expect the other side to challenge you on liability (whether the accident was really the other side’s fault). You can expect the other side to challenge you on the extent of your injuries. You can expect the other side to challenge you if you have had other similar injuries. It is in these moments that you can be thankful that you have chosen a lawyer who is fighting hard alongside you. After all the time and work you and your lawyer have put into preparing for trial, at the end of the day you are entrusting your case to 12 people you have never met before. What will they do? How will they decide the facts? We lawyers try to anticipate what might happen, but no one can ever really know for sure. Jurors are people, and no two people are exactly the same. Once the trial is finished, the jury will deliberate on the evidence and the law. They will render a decision, which is called a verdict. Once the jury gives the verdict, the judge will hear any remaining post-trial motions from the losing side, and the case is done. Sometimes winning (or losing) a jury trial in your personal injury case is not the end of the story. Depending on the specific case facts, you and your lawyer may decide to file an appeal of an unfavorable verdict. On the other hand, you may be celebrating a win only to get notice that the other side has appealed. Your lawyer will most likely try to minimize the number of issues that could arise to trigger an appeal, but you never know for sure what may come up at trial. What questions to you have about the legal process? I hope my step-by-step guide has been helpful in giving you an idea of what to expect if you’ve been in a car accident. What questions do you still have about the legal process? Leave them in the comment section below. I’ll either reply or make them the subject of upcoming blog posts. 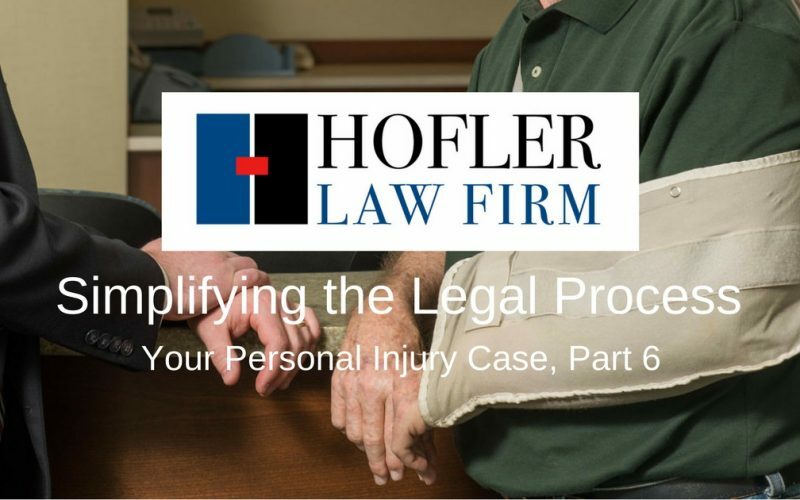 Hofler Law Firm offers help to injured people. If you have suffered a personal injury because of someone else’s action, you may be entitled to compensation. I am familiar with the litigation process, and I want to meet you. Contact Hofler Law Firm today to schedule a free consultation.